A modern-day nightmare took place at 8:07 AM on the morning of January 13, 2018, in Hawaii when radios, televisions, and mobile devices began to broadcast a statewide alert about incoming ballistic missiles. 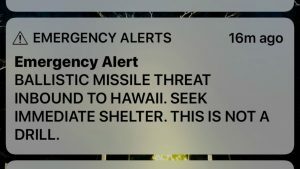 This alert came from the Hawaii Emergency Management Agency and, in light of recent escalating tensions between North Korea and the United States, there was no reason for the average citizen to disbelieve the ominous message in all capital letters that stated “BALLISTIC MISSILE THREAT INBOUND TO HAWAII. SEEK IMMEDIATE SHELTER. THIS IS NOT A DRILL.”. What followed was 38 minutes of sheer terror for many people throughout the entire state. Stories can be found of parents attempting to hide their children under manhole covers, tourists running to hotel basements for shelter, and many people making tearful goodbyes. The prospect of nuclear annihilation ceased being a Cold War era concern of the past on that terrifying morning, and suddenly became a reality of the here and now. When it was clear that there were, in fact, no missiles on their way to Hawaii, the governor and other state officials took to social media to reassure the public that the alarm was false. However, the official alert did not come until 8:45, leaving an entire US state rattled and an entire nation confused as to how something this important could have been so susceptible to human error. The official explanation for the false alarm in Hawaii is that during a routine testing of the system during a shift change, it was originally reported that a technician mistakenly “pushed the wrong button” that resulted in the sending of an actual message as opposed to a test one. Unfortunately, this is not the first instance of human error acting as a catalyst for a false alarm in an emergency alert system. Last year in Iowa, a similar data entry mistake resulted in the issuance of a civil disturbance alert that advised the public to remain indoors for its duration. Likewise in Guam, an area particularly concerned with potential missile attacks from North Korea, a false alarm was issued last year that was clearly found to be the result of human error. Though this happened around midnight with fewer people awake to potentially panic, those who were there in front of their televisions and saw the false alert scrolling across their screens with its ominous message to take cover. It is simply unacceptable for a population to have to endure a scare of this magnitude, and now emergency planners all over the country are revisiting their workflows to prevent one from happening again. An emergency alert system, by nature, is something that can never be fully automated. The ever-changing scenarios involved in potentially catastrophic events call for flexibility and insight that computers are simply not capable of. This caveat comes with increased risk of whomever is in control to potentially make mistakes in either the operation or maintenance of that system. A chilling example of this can be seen two years ago when two trains collided in Italy due to a faulty and outdated alert system that was far too susceptible to human error. This alert system relied on relayed phone calls and radio broadcasts that have been obsolete for at least the past 20 years, and it has spotlighted the need for modernization in services that carry this much importance. Regroup Mass Notification is a company that specializes in bringing the most reliable and user-friendly mass messaging system to our clients through the most advanced technology available. Though we make no claim to completely eliminate the potential for any human errors, communication platforms provided by Regroup can be customized to put as many safeguards in place as needed to help prevent them. There should never be a case of a “wrong button” being pushed in systems that contribute to public safety. Our long-standing partnerships with response agencies such as Governance and Emergency Management Canada Inc., emergency planning agencies such as CEMA, and risk management firms like the internationally acclaimed PrivInt Corporation have given us special insight into making important alert systems work as efficiently and accurately as possible. From that foundation, proper training can further help to prevent instances of human error that result in false alarms like what we’ve seen recently.